In many cases, biotic homogenization involves the replacement of local floras and faunas with 'introduced species', sometimes referred to as aliens. 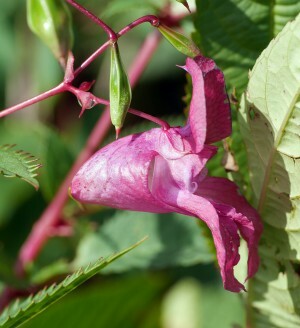 Examples of plants that have been introduced and spread are himalayan balsam and japanese knotweed. The himalayan balsam was introduced as a garden plant to the U.K., sometime in the mid-nineteenth century. It flowers from June right through to October producing seeds long after most other annuals. The black seeds form in capsules that 'explode' when mature, dispersing the seeds. Regrettably, the himalayan balsam did not stay in Victorian gardens. It spread. It is now found in a wide variety of habitats; waste land, roadside and railway lines, damp woodlands and particularly river banks, where it poses problems. The sheer size of the plants means that other plants are shaded out of existence, or the competition for minerals, water, or space is simply too much for them. There are ‘knock on’ effects in terms of the the invertebrate populations, insects, beetles, butterflies, spiders etc. Plants such as the himalayan balsam have broad tolerances to environmental conditions, effective dispersal mechanisms and high rates of reproduction / seed production). However, introduced species are not the only cause of biotic homogenization - environmental change can promote the expansion of some species at the expense of others. Work by researchers at Bournemouth University (Sally Keith) and the Centre for Ecology and Hydrology (Professor James Bullock ) indicates that this process is 'at work' in woodlands. They looked at the change in species composition of woodlands in Dorset from the 1930’s to the present day. The data for the 1930’s were made available by Dorset Environmental Records Centre, namely the field results of Professor Ronald Good - who recorded the species present at many sites throughout the county (which he visited on his bicycle). 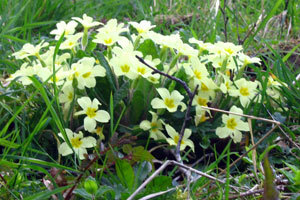 The modern species data were obtained by revisiting 86 of his woodland sites. 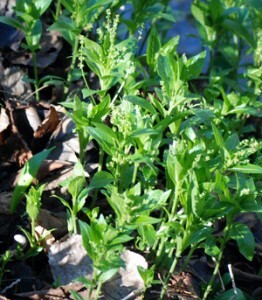 The plant communities now present in the woodlands studied suggest that the soil is now more fertile, and there is less light within the woods. 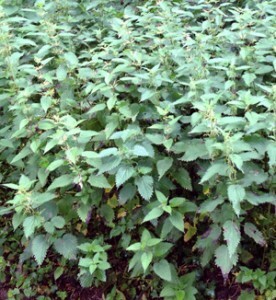 It is known that the extensive use of fertilisers on farmland has lead to increasing ‘nitrification’ or eutrophication of the woodland environment, offering opportunities for species like stinging nettles to dominate. The light loss may be explained by the decline in the use of traditional management techniques - such as coppicing, leading to greater shading by the canopy, altering the environment of the woodland floor. The creation of clearings, paths, and rides, plus coppicing allows light to 'flood' in; plants can 're-establish' themselves from the seed bank in the soil. The ‘richness’ of woodland seed banks has been demonstrated, for example, by Erenler, H. E. et al. They conducted germination trials from soil cores taken from ancient woodlands. Seeds from some 81 different species germinated, though soft rush / common rush (Juncus effusus) accounted for some 80% of the emergent seedlings. Himalayan Balsam – nemesis is nigh ? 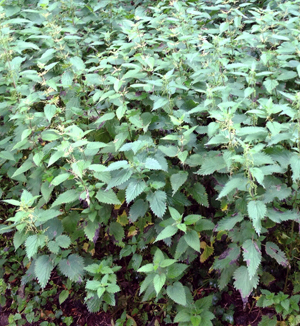 Invasives and aliens – PlantTracker app.